On Shorter Ave. NW (Hwy 20) on the western edge of town. The muffler art was created by Jessie Jones, who worked at the Muffler Shop until it closed. The family was his family: himself, his wife, and his children. He also sculpted a number of animals over the years. Several articles were written about his art. Jessie passed away 11/24/2018. Muffler family is gone -- muffler shop went out of business and the building is for sale. 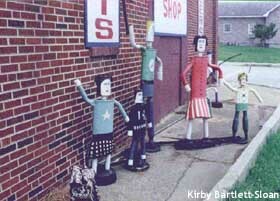 Photographic verification that the "Muffler Family" members in Rome, Georgia, are not Muffler Men -- but muffler auto part sculptures. Rome UPDATE: Turns out the main highway thru town, GA 20, is Shorter Ave. I told the girls to keep an eye out for the "Giant Statues"(the girls are only 3 and 4 years old). We got to an older, more run down area and I saw quite a number of muffler shops. I was thinking "jackpot soon". The "muffler family" is muffler art. They are outside of a muffler shop and are made of actual mufflers. The group numbered about 7 or 8. They were right on the sidewalk and I did not let the girls get out of the car. They are clever folk art but not the big guy.